In September, Department of Housing and Urban Development (HUD) Secretary Ben Carson surprised the housing community by picking sides in the debate between pro- and anti-growth factions. Tweeting in response to a Bloomberg View column, Carson said that HUD “is taking on the #NIMBYs…we must look at increasing the supply of affordable housing by reducing onerous zoning regulations.” For readers who have avoided the increasingly cantankerous debate in neighborhood meetings and on social media, the Not In My Backyard (NIMBY) faction mostly consists of long-standing homeowners who oppose new development. Their opponents, the YIMBYs (Yes In My Backyard), are mostly younger renters, who see rising housing costs and insufficient development as obstacles to living—and buying homes—in high-cost regions. Urban economists almost universally agree with YIMBYs on the cause of the problem: Local land use regulations constrain new housing development and contribute to rising housing costs. The problem is particularly acute in some of the most productive metropolitan areas, including San Francisco, New York, and Greater Boston. But there is far less agreement on how to induce NIMBY homeowners and local governments to reform their zoning—whether to bribe, bully, or appeal to their better angels. Secretary Carson’s first concrete step towards “taking on the NIMBYs” was to suggest that the Obama-era Affirmatively Furthering Fair Housing (AFFH) rule should be revised to make receipt of HUD funds, particularly from the Community Development Block Grant (CDBG) program, contingent on local zoning reform. HUD has issued a request for public comments on revising the rule towards this end. The idea did not originate with Carson, however. President Richard Nixon’s first HUD Secretary George Romney suggested that HUD should not approve infrastructure requests from communities with discriminatory zoning. Both Democrats and Republicans have supported some version of the plan. New Jersey Senator Cory Booker sponsored a bill that also proposed tying CDBG funds to local zoning reform. For CDBG to provide HUD an effective lever to change exclusionary zoning, CDBG needs to be a substantial revenue source for exclusionary communities. 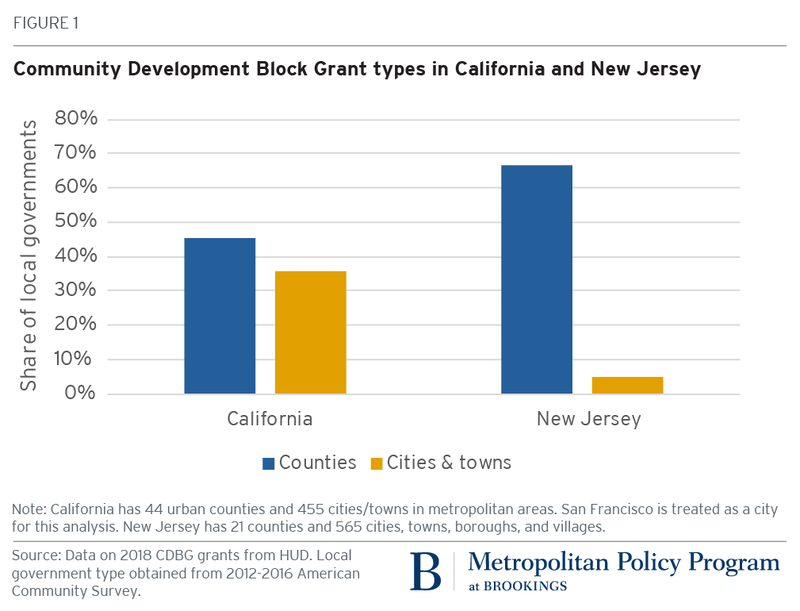 In this brief, I look at whether CDBG grantees overlap with exclusionary local governments, focusing on California and New Jersey. California has some of the nation’s most expensive housing and lowest housing production. New Jersey has a decades-long history of wealthy suburbs attempting to block housing that is affordable to low-income families. CDBG is in fact not one program but several different funding streams with somewhat different geographic targets. Most relevant to HUD’s goal of inducing local zoning reform is the CBDG Entitlement Program, which provides funds to large cities and counties. A statutory formula set by Congress determines the amount of funding for each locality, based on population size, poverty, housing age, and housing conditions. By design, larger and poorer communities receive more funds through the entitlement program. If HUD wants to change the behavior of local governments by withholding CDBG funds, cities that are directly funded by HUD rather than through an intermediary should be most responsive to the agency’s pressure. Some CDBG Entitlement Program funds go to large urban counties, which can in turn distribute those funds to smaller towns that do not qualify for direct allocations. Rural communities can receive funds from state governments. Counties and states have considerable discretion over how to divide CBDG funds among smaller communities. If HUD wants to change the behavior of local governments by withholding CDBG funds, cities that are directly funded by HUD rather than through an intermediary should be most responsive to the agency’s pressure. 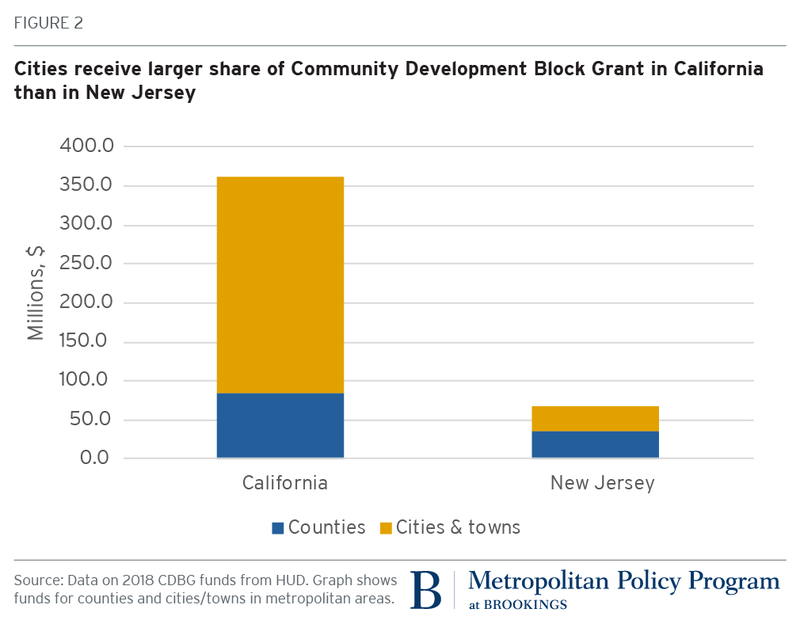 Based on the types of government receiving CDBG funds, the program offers more potential leverage for zoning reform in California than in New Jersey. More than one-third of California’s cities and towns receive CDBG entitlement funding, as do nearly half of urban counties (Figure 1). Cities and towns are responsible for zoning all incorporated land; counties oversee land use regulation for unincorporated land. Only five percent of New Jersey’s cities and towns—the entities responsible for local zoning—receive CDBG entitlement funds. On average, cities and towns in New Jersey are much smaller than those in California, so fewer qualify to CDBG directly. About two-thirds of New Jersey’s urban counties receive CDBG funding, and can pass that along to smaller cities and towns at the county government’s discretion. The same mismatch between CDBG entitlement grantees and entities with zoning power will occur in states such as Massachusetts and Pennsylvania. At a minimum, HUD should conduct a state-by-state analysis of CDBG’s potential effectiveness in reforming local zoning. About three-quarters of all CDBG funds in California are allocated directly to cities and towns, with the remaining quarter going to county governments (Figure 2). Among CDBG grantees, the average California city received about $1.7 million in 2018, or just under $10 per capita. In New Jersey, about 45 percent of CDBG funds accrue directly to cities and towns, with an average grant size of $1 million, or about $13 per capita. HUD could use CDBG to exert influence over a small share of New Jersey’s communities with zoning authority, and over a larger share of California’s cities. The CDBG program is intended to support community development activities in cities with relatively high poverty rates and poor quality housing. These factors determine the formula used to allocate funds. Unsurprisingly, therefore, cities and towns that receive CDBG under the entitlement program have lower incomes and less exclusive housing markets than communities that do not receive CDBG (Table 1). Household incomes and rents are lower among CBDG grantees in both states. CDBG grantees have more rental and multifamily housing. These are important distinctions for identifying exclusionary communities, since most low-income families are renters rather than homeowners, and apartments are cheaper than single-family houses. Housing density is also a useful indicator of exclusionary zoning, since requiring large lot sizes is a standard zoning tool for exclusionary communities. Similarly, the amount of CDBG per capita is negatively correlated with median income and median rent, and positively correlated with the shares of rental housing, multifamily housing, and housing density. Consistent with CDBG’s program design, few of the most exclusive communities receive CDBG entitlement funding (Figure 3). For this analysis, the most exclusive cities are defined as those with high rents and little rental or multifamily housing (see Appendix for more details on methodology). In California, only 17 percent of the most exclusive communities receive any CDBG funding, compared with 37 percent of less exclusive communities. The exclusive communities that do get CDBG funds receive half as much per capita as less exclusive places ($5 per compared to $10). CDBG is even less effective at targeting exclusive housing markets in New Jersey: None of the most exclusive communities receive any direct CDBG funding. Six percent of the state’s less exclusive cities and towns receive CDBG Entitlement funds, around $13 per capita. Some of the California cities that receive large absolute or per-capita CDBG allocations – including San Francisco, Berkeley, and Los Angeles – do have exclusive neighborhoods within their borders. 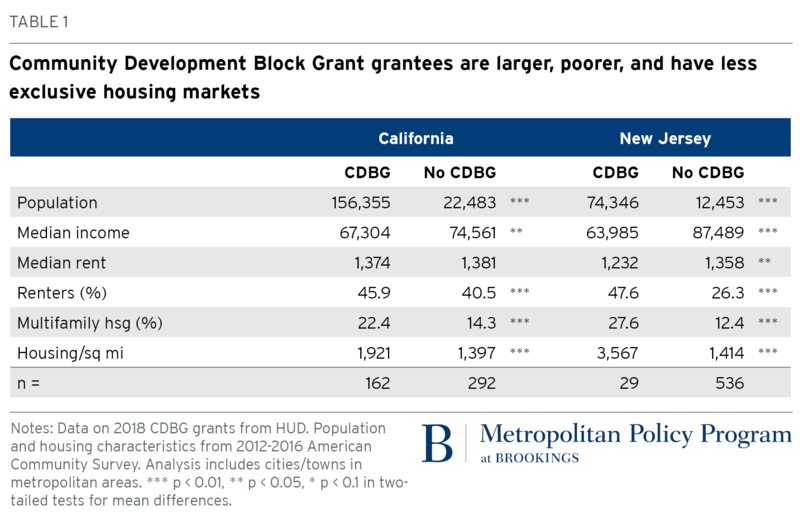 (The large cities receiving CDBG in New Jersey are much poorer than large California grantees.) HUD can and should encourage select cities to reform neighborhood-level zoning and to build more affordable housing in affluent areas. However, low-income residents who are the intended beneficiaries of CDBG projects have little political influence over zoning decisions in affluent neighborhoods. Moreover, these cities are a small share of CDBG grantees. Undertaking the costly process of revising a federal regulation that affects thousands of communities in order to influence a handful of grantees is like performing brain surgery with a chainsaw. 1. Use the bully pulpit. When the HUD Secretary speaks on an issue, he draws attention from a wide audience, including media, affordable housing advocates, real estate industry members, and local governments. He shouldn’t underestimate the power of the bully pulpit. Explain how restrictive zoning harms not just low-income families but regional housing markets. Name and shame worst offenders, or applaud cities that have undertaken zoning reform. Provide direct guidance on what specific zoning practices should be changed. 2. Tap into HUD’s existing research and expertise. Secretary Carson’s speechwriters have a wealth of internal expertise to draw upon in developing his speeches. For more than a decade, HUD has conducted, compiled, and published research on land use regulations. HUD’s in-house researchers in the Office of Policy Development and Research could deploy their considerable expertise to help HUD better focus its efforts. 3. Convene key players and have an honest conversation about political realities. Another one of HUD’s unique strengths is its ability to convene discussions among state and local government officials (even those who don’t receive HUD funds directly). Over the past year, innovative approaches to zoning reform have bubbled up across states and localities. If HUD really wants to tackle the NIMBYs, it should start by putting all the players in the same room, and encourage them to move past the political stalemate. HUD’s interest in persuading local governments to reform exclusionary zoning is admirable. But withholding CDBG would not be an effective mechanism, because exclusionary communities receive very little CDBG funding. David Harshbarger provided excellent research assistance for this analysis.